Baked Crispy Chicken Wings – Ridiculously Crispy on the outside, tender and juicy on the inside, and oh-so-flavorful! And the best part? You won’t feel bad indulging in them. 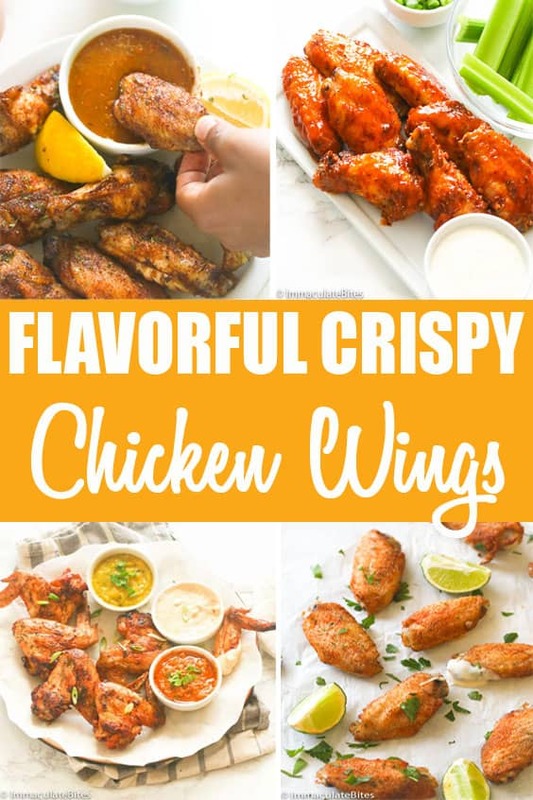 PLUS other finger-licking good chicken wings recipes to add to your collection. Are you ready for crispy, baked and spicy chicken wings ? I guessed right. Who wouldn’t be? It wasn’t long ago before chicken wings became part of my family lexicon- though these days I can hardly ever imagine that there was a time that I rarely made these wings at home. They are so easy to make and you have the freedom to include whatever spices to match your mood or guests. So after years of buying chicken wings at pizza places, restaurants, I wanted to make my own chicken wings- one that is crispy, nothing beats that crispy first bite! Since I am always looking for ways to cut down on my calories intake, I like baking food and see which ones hold up to the test, without comprising taste and texture. These, certainly do! 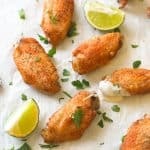 How to make crispy chicken wings? After reading Alton Brown’s method of achieving crispy chicken wings, I decided to incorporate some of his techniques; letting the wings dry in the fridge for about an hour, sometimes overnight. However, if I’m press for time, I just use a clean towel to dry it up. Drying the chicken makes a huge difference in making the wings crispy. After mixing the wings with spices – paprika, onions, garlic powder, chicken bouillon powder and dried thyme, I drizzle them with canola oil and bake; rotating the wings half-way through baking. Before baking, I line my baking pan with aluminum foil for easy clean up . See how crispy they are? 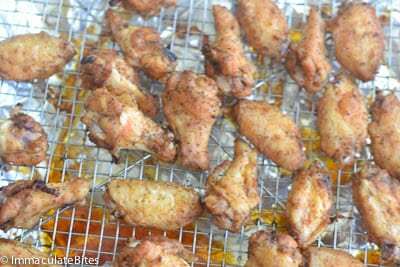 And since Super Bowl is just around the corner, I decided to add a list of other scrumptious chicken wings recipes to add to your repertoire. You could also conveniently alternate preparing them whether as a regular weeknight meal, for game days or as party appetizers. Dig in! 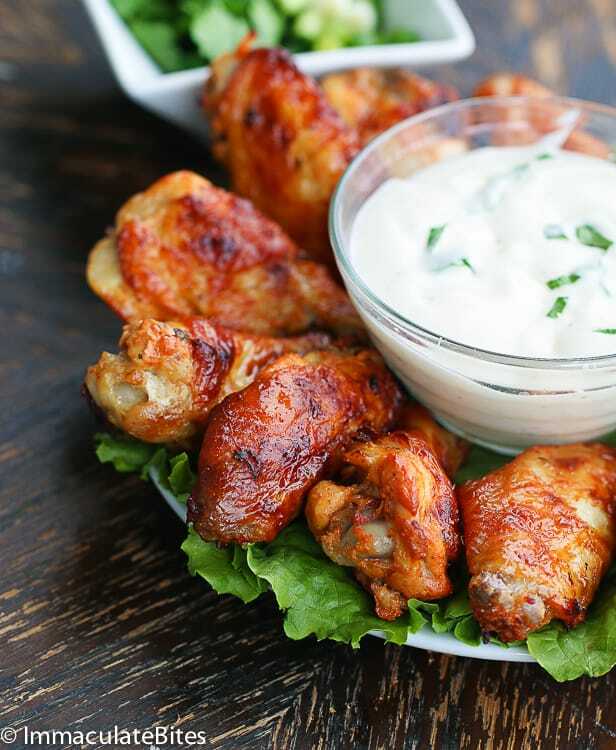 Chicken Wings Shawarma – Crisp and tender finger-licking good baked chicken wings marinated in a lemon, garlic, nutmeg, paprika, cayenne and yogurt mixture. So tender and juicy on the inside and crispy on the outside. Pair it with a low-fat ranch dressing! 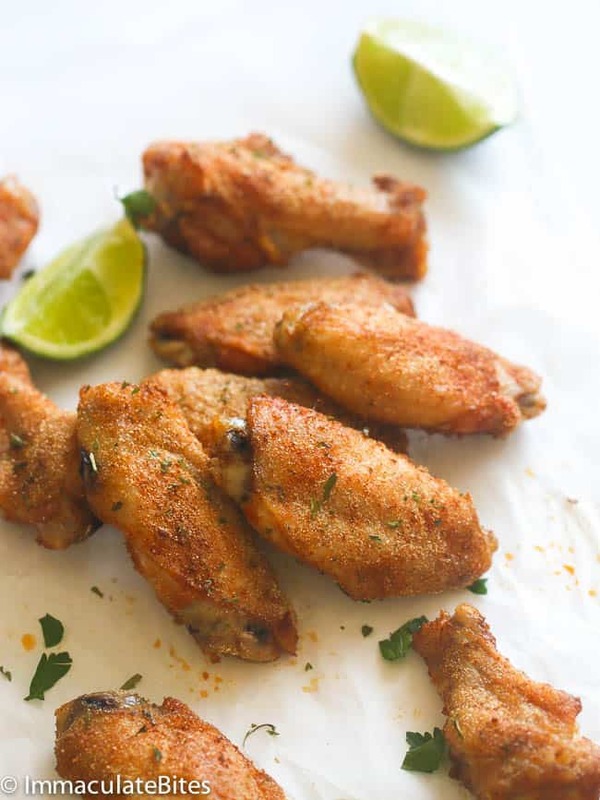 Baked Jerk Chicken Wings – Who doesn’t go crazy over jerk chicken? They are absolutely a crowd-pleaser. So I went ahead and sprinkle these chicken wings here with the big bold flavors of jerk spice rub. 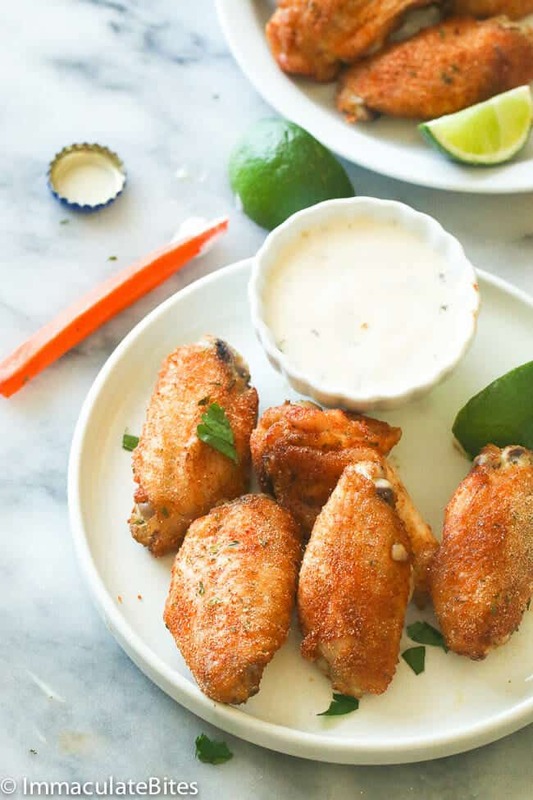 You would hardly need a dipping sauce to go along with this very flavorful chicken wings. And they’re baked, too! 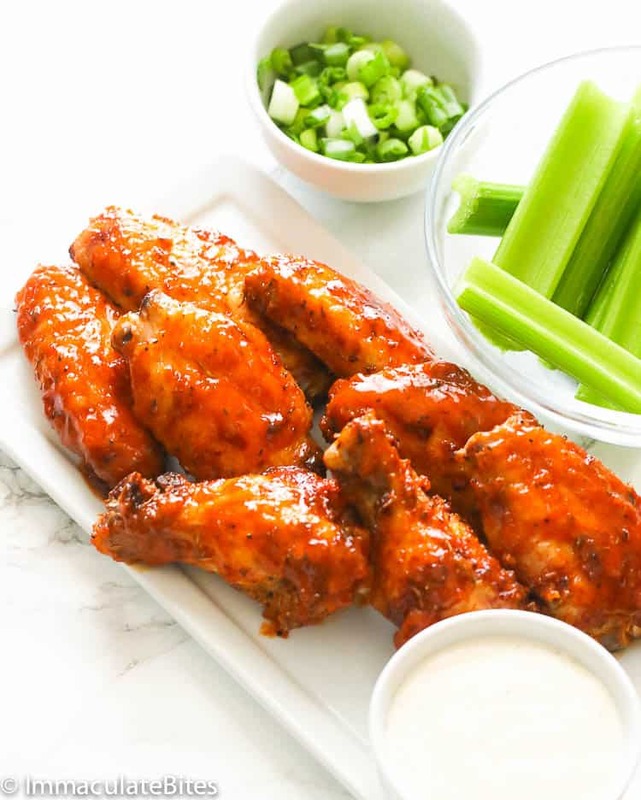 Buffalo Wings – Perfectly crispy chicken wings tossed in a classic spicy buffalo sauce served with ranch dressing and celery for the ultimate game day and party snack favorite. And you only need F-I-V-E simple ingredients to make that buffalo sauce! 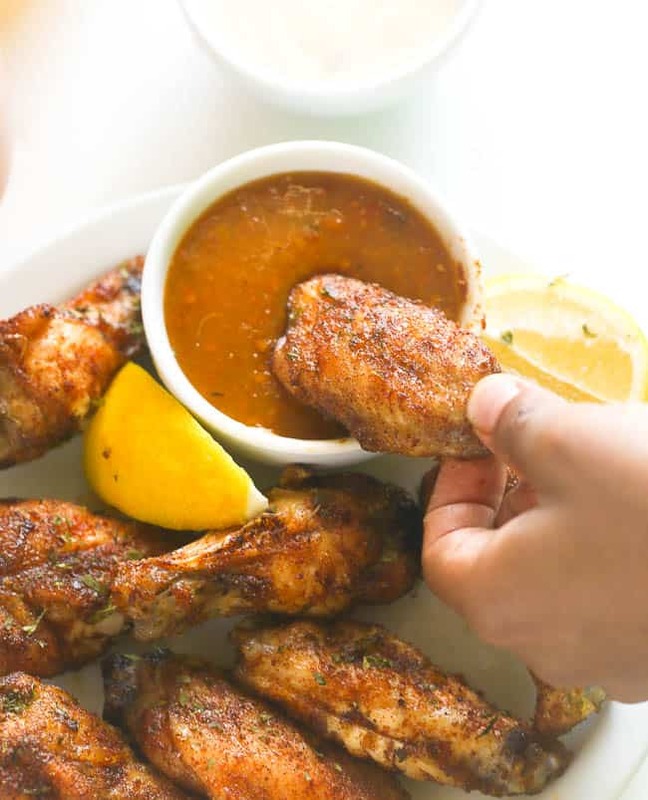 Caribbean Stick and Hot Wings – This delicious Caribbean Sticky wings full of Caribbean flavors – a little spicy, sweet and super easy to make on a grill or in the oven. Just a great balance of sweetness, saltiness and spiciness. 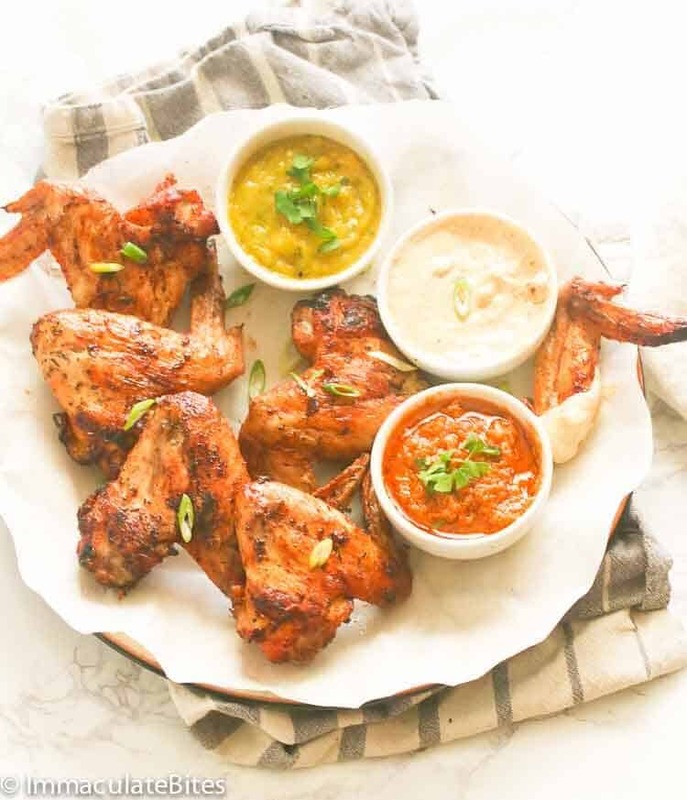 Grilled Chicken Wings – And our list wouldn’t be complete without these beautiful grilled chicken wings with the flavors of thyme, onion and garlic powder, paprika, cayenne pepper and brown sugar. Grilled to perfection for the ultimate outdoor finger food! Pair it with any of these three easy to prepare homemade sauces: African Pepper Sauce,Caribbean Pepper Sauce and Remoulade Sauce. 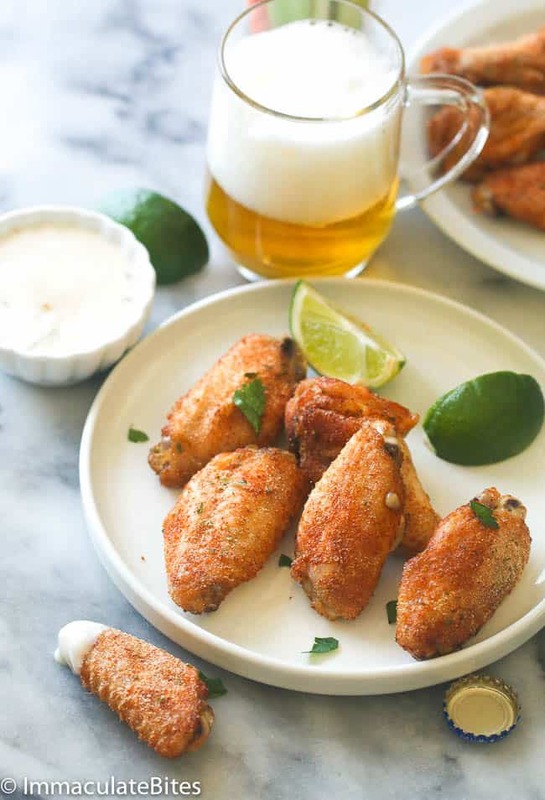 Now go ahead and experience a real game day or party with these crowd-favorite and versatile chicken wings recipe. Hmmm… I may have given you a tough job today to choose which one to prepare. Or better yet, make them all! This post was first published on January 2017 and has been updated with new content. Baked Crispy Chicken Wings - Ridiculously Crispy on the outside, tender and juicy on the inside, and oh-so-flavorful! And the best part? You won't feel bad indulging in them. 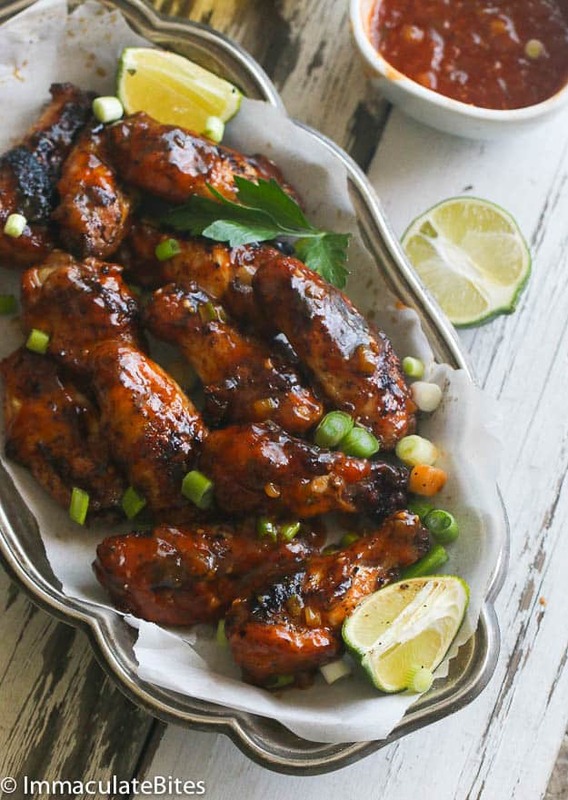 PLUS other finger-licking good chicken wings recipes to add to your collection. 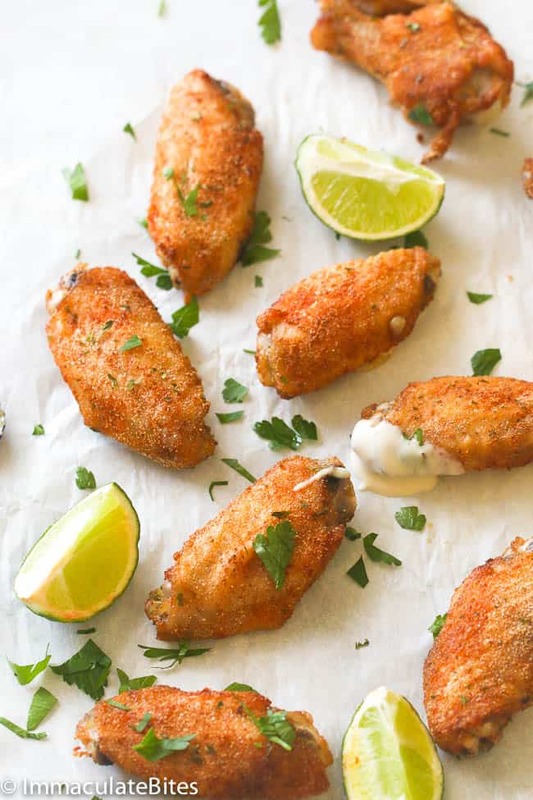 Wash chicken wings and place them on a cookie sheet in a single layer , then let them sit in the fridge for a minimum of 3 hours or preferable overnight. Do not cover them, let the air dry them out. When ready to bake , preheat oven to 425°F. Place the chicken in a large bowl, with all the spices, then drizzle with vegetable oil . Line a baking pan with foil; top with a wire rack. Arrange chicken wings out in a single layer . While the chicken wings are baking, oil will slowly drip to the bottom of the baking pan. 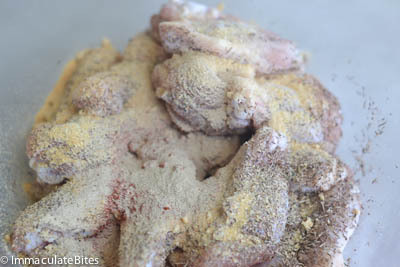 Bake wings until cooked through and skin is crispy, about 45-50 minutes-rotate wings half way through-roughly 20 minutes . Remove and serve with your favorite chicken wing sauce. Mix, then drizzle with vegetable oil. 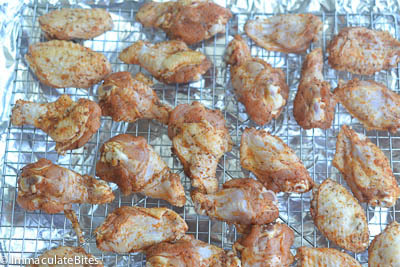 Bake wings until cooked through and skin is crispy, about 45-50 minutes-rotate wings half way through-roughly 20 minutes. Remove and serve with your favorite chicken wing sauce. I’ve made this over a dozen times in the past 2 years (as wings and legs), always a show stopper. I’ve made these in both a oven and a smoker (which really brings in an awesome touch). These are so good that at pot lucks and parties, these are repeat requests from others. One trick I use to help with drying out the skin is I point a small fan on the chicken while in the fridge to cause more air motion (yes, crazy, I put fans in my fridge). Imma, this recipe was sooo good! 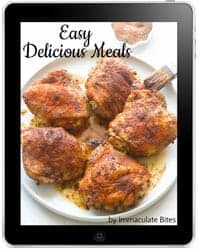 I have tried several of your recipes which came out fabulous and delicious!! Thank you!! Your site is my top favorite!! I can’t wait to try out many more!! Kudos to you! Thank you, Shila! Glad it turned out well for you. I can’t wait either for you to try my other recipes. Enjoy! Any suggestions on what to serve this with? I’m working on a home ec. project. The only thing I could say is to go ahead and make it without the rack. The top part would still be crisp. I’ve made foil strips (3-4) and laid chicken pieces on top of these Not 100% like a wire rack but I saw Martha Stewart do this once for the same reason…no rack. I love your recipes and this was another winner! I’d like to give you a recipe for easy oven-baked fish nuggets, though it can be easily adapted into chicken ones. It comes from one of Benedetta Parodi’s books, she is a popular Italian writer for easy and family-friendly dinners. I admit her recipes tend to be good, this one in particular she got from a woman named Rosa. Mix everything. With a tablespoon, form balls from the mixer, roll them in breadcrumbs (I like to use corn breadcrumbs because of its taste and crunchyness, but any will do) and put them in a single layer on an oven tray over parchment paper. Drizzle some olive oil again and put them into the oven; after 10 minutes, they should have a nicely browned top. Turn them the other side over and cook them for other 10 minutes or so. They are not crunchy like fried nuggets, but pretty soft inside and won’t resemble cardboard like some more unfortunate baked nuggets do. You can customize them a lot: I made versions adding cumin seeds, soy sauce, chopped up chilis, paprika, Creole spice mix, etc. I also made meat versions using chicken and sausage, marinating them in beer beforehand, and then using Mexican-inspired flavors such as onion, lemon, cumin, chili…they are really versatile. In my house frying is almost impossible so this recipe helped me a lot! Lol. Sorry, I meant “nicely browned bottom”, that is, the side making contact with parchment paper. This recipe is for 4 people more or less. THANK YOU SO MUCH! For taking the time to write this up. Happy New Year! If you go the chicken route I’d suggest marinating the meat in beer first, and maybe use a bit of sausage or other highly flavored meat, as baking will never replicate the clean but delicious taste of fried chicken :(, so without some help from umami sources you risk getting bland nuggets (or cheat with some Maggi lol). But I bet you already knew that. One huge plus of these baked nuggets is that they reheat well, unlike fried ones, so they make great leftovers. Hi There, down here in New Zealand we know our food, fresh- tasty- or just so dam good…. Today- its the second- love these, adapted just a touch as good cooks do when needed, didn’t have thyme but did have Baggs dry seasoning (smells like a really good chicken stuffing herb mix )also added just a touch of brown sugar to soften the flavour of the extra herbs, So amazing…served with greek yogurt as a side sauce, oh la la So good…and low carb high protein, healthy! AWESOME! Thank you for taking the time to share your thoughts with us. I am so suprised that these chicken wings are baked and not fried – they look so crisp, golden and crunchy.. not to mention delicious! I only have one word to describe this – AMAZING! They were the first to go at my superbowl party. Thanks ! Better than your favorite wing joint? Thanks so much Naomi! Thanks for a fantastic recipe. We live in a rural location and are always hunting for restaurant quality recipes that we can make at home since restaurants and takeaway are so far away. Made recipe as written except added a few tbsp of flour to the spice blend since the seasoned wings looked a bit too wet. These turned out even better than our favorite wing joint! Will be checking out more of your recipes for sure. Dana sorry to here about your mishap, you are coating the chicken wings with oil- so only use one tablespoon of oil.Don’t forget to line the bottom layer of your baking pan with foil paper. I am glad you are safe and that they were really worth it! Thanks Rosa . I know you and your family will enjoy it! 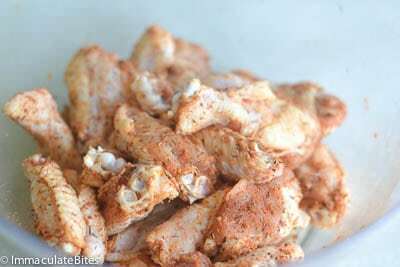 This recipe is best suited for chicken wings, I never tried it with chicken legs or thighs. If you do…. just increase the spices . Please report back if you make them . Thanks kelsey . Can i use chicken legs and thigh for this recipe ? I made these on Friday night and they were awesome! I’m making them again tonight! My family loves chicken wings so this gave me a nice variation that they liked! I will work on the pepper recipe … just for you kelsey. Will have it up in a couple of weeks. Thank you so much for trying out my recipes. Terrell, I am glad your family enjoyed it ! Thanks for reporting back! I baked the chicken yesterday and it came out really good and tasty. I was worried about the thyme flavor because I don’t like it very much but I was surprised I loved the end results. But next time if I could omit thyme then I will. Thank you so much for making me visit the kitchen frequently. What I am still waiting is the recipe for pepper sauce that could be used to eat roasted fish or chicken. I have tried so many different recipes for pepper but none has satisfied me. But I trust your cooking. So I am still patiently waiting . Thank you once again. You are such a great cook. Hi! Quick question about the wire rack (I’m SO not a chef:)…can this be just ANY wire rack?? Like the kind I’d use to cool cookies on? Thank! Lindsay, that is what I used. Let me know how it turns out. Rosa, am keeping my fingers cross , can’t wait to hear how it turns out. You can do it girl! Rosa, I wish I could take credit for that! but I can’t. You are such a sweet heart. THANK YOU for reporting back. I love your site!!! My husband loves your curry goat recipe and today these wings were a success. I will be trying your Okra soup recipe next. My husband is Nigerian and grew up on okra soup. I have yet to find step by step instructions with great reviews!! AWESOME! Thanks for taking the time to let me know. Am THRILLED!